There’s no doubt that wandering the streets of Annecy old town was just so beautiful! I honestly couldn’t believe my eyes as we wandered around the narrow alleyways and along the river. The first evening was probably my favourite, when you see everything for the first time! We had the most amazing light, the river was full and the colours were just amazing! Sadly, we woke up the next morning to find the river had been almost emptied for cleaning, and it stayed like that till at least the friday. I was so gutted, but I’m glad we managed to see it ‘normally’ for one day at least. 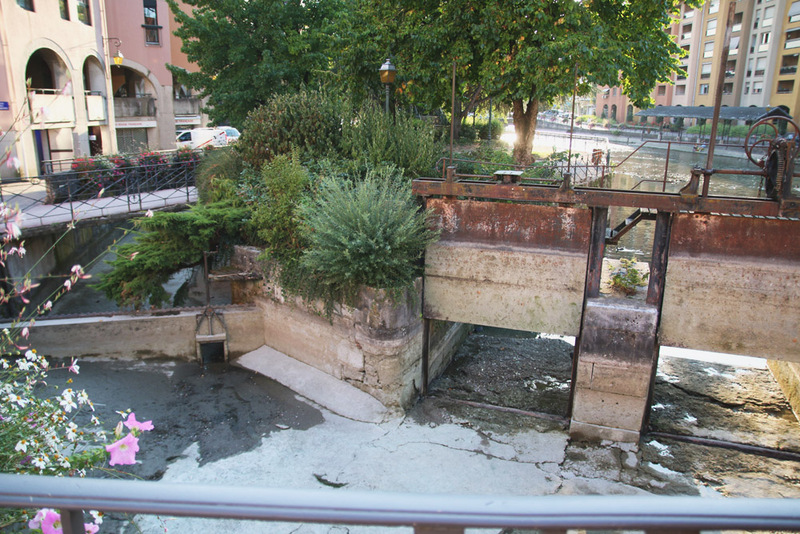 It’s amazing how thoroughly they clean the whole thing – they drop the water level, put in some kind of hoover to take the litter out, then a bunch of guys walk down the river so slowly with pressure hoses and scoop up all of the dirt from the bottom! We stood for a good 5 minutes watching haha! You can actually go in the Palais de I’lle (the really old building above) which used to be a prison, a mint and is now a museum, but we had so many other things planned that we never got the time to explore it. It’s on it’s own little island surrounded by little streets and bridges covered in flowerboxes. We didn’t have much luck while we were there, because the palace is under renovation this year too! If you ever visit Annecy, or the Haute-Savoie region in France, then you have to order a tartiflette at some point which is a potato cheese dish that was created by the rebluchon cheese producers to encourage sales of the cheese. Mine was just ok, so I wouldn’t recommend the specific restaurant that we ate at, but literally every restaurant in Annecy old town has it on the menu. I absolutely loved the flower boxes lining the river. They were pretty much all over Annecy old town, even on the windowsills in the back streets too. I was actually a little suprised by how small the old town is. When we visited the farmers market, it pretty much took over the whole of old town for the morning! It takes around 5-10 minutes to walk from one end of old town to the lake, and the walk is so stunning right along the edge of the river lined with restaurants. I was a little worried that our airbnb apartment would be a little too far away from the old town, but it was only a 10-15 minute walk, so it was actually pretty perfect! Have you been to Annecy before? If not, you have to book a trip ASAP – it is amazing! I honestly can’t wait to go back some day! Very nice pictures! Beautiful houses and flowers. I love the old quarters of cities very much. So much atmosphere and history! Thanks, Darina! They’re always so much nicer to explore I think than newer parts of cities! Thanks! I’d definitely recommend it! You just have to visit! I’ve never been there before, but damn the photos look beautiful! Definitely wanna go there ASAP! <3! It’s definitely one of my favourite places in Europe! I’d definitely recommend it! It’s so lovely there isn’t it?! I just want to go back again! It makes me want to visit more of France – especially all the old towns around Nice! Oh wow! Luckily it didn’t smell at all in Annecy, but I couldn’t even imagine how horrible the smell would have been in Milan! The pictures look great and it looks like you had a great time! 🙂 Love reading about your travels.